This postseason, there are two clear-cut favorites to reach the NBA Finals — the Cleveland Cavaliers and Golden State Warriors. All season, it has seemed inevitable that Warriors-Cavs III will tip off on June 1, and even with some ups-and-downs this regular season, nothing has changed in that regard. But before either team can play that Finals rubber match, they'll have to get through their respective conference playoffs, and there are six teams — three from each conference — that could make that journey difficult. The Cavs and the Wizards have been two of the worst defensive teams in the NBA this season, so we're going to see plenty of points in this series, should the two teams meet. And we're particularly going to see a lot of points if the Wizards can get out in transition on offense. Washington was one of the best transition teams in the NBA this year, scoring 1.19 points per possession (third in the NBA), with a 63.5 percent effective field goal rate (fourth), and the lowest turnover percentage on the move of any team in the postseason. So much of this has to do with point guard John Wall's speed — he's arguably the fastest player in the NBA and thrives when the style of a game is end-to-end. Washington's transition skills would be an advantage in any series, but it's particularly important against the Cavs, who are hands down the worst defensive team in transition in the NBA. The Cavs allow opponents to score 53 percent of the time in transition, with a 63 percent EFG — all coming to 1.18 points per transition possession, the worst mark in the NBA. The Wizards have shown that they want to play with pace against the Cavs this year and will be extra aggressive on defense (what's a little bit more aggression going to hurt?) to try to create fast-break opportunities the other way. 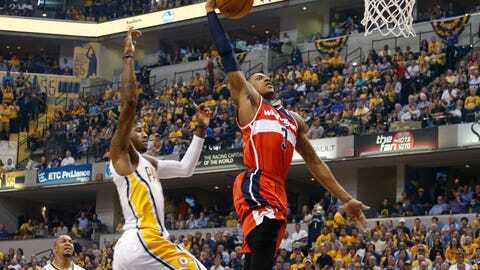 If the Wiz are able to do that in a postseason series against the Cavs, they will have a massive advantage. This doesn't make the Wizards unique — there are plenty of teams in the NBA that can effectively space the court — but Washington has lineups that can particularly challenge the Cavs. With Markieff Morris (36 percent), Otto Porter (43.7 percent), and Bradley Beal (40 percent), the Wizards' top lineup — which includes Marcin Gortat and John Wall — has three willing and capable 3-point shooters who can also attack the rim. It's that inside-out threat to the defense that can tug and prod a bad Cleveland defense in effective ways — particularly if the Cavs continue to overcommit to help side defense (as they have been doing in recent weeks) in the postseason. The shots are going to be there, and if that top lineup can knock down 3-pointers at the 40 percent clip they did in the regular season, it's going to be difficult for the Cavs — whose second units have been mercurial at best — to outscore Washington. 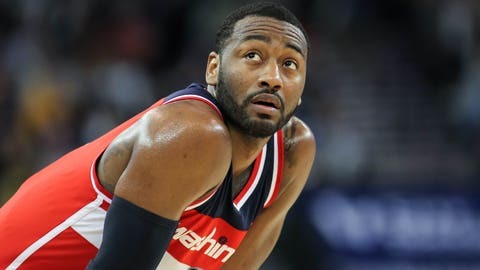 Wall is a household name and widely considered one of the best players in the NBA, but if Washington draws the Cavs this postseason, expect him to have the series of his life. I've already mentioned the transition advantage the Wizards have — Wall is going to reap the benefits from that — but Wall should also thrive in the half-court against Cleveland. Wall's game hasn't come close to its peak, but it doesn't get enough credit for how refined it can be at times — when Wall gets into the paint, he's incredible. The trick to stopping him is to get him to shoot the ball (typically by an icing). But the Cavs don't have anyone, save for LeBron, who can make that happen. Wall might not be the best pick-and-roll point guard in the NBA, but expect him to have a field day against Kyrie Irving, who was is expected to be the primary point guard mark now, but allows a staggering 0.96 points per possession on the pick-and-roll. And don't expect Deron Williams to do much better — not only would he be burned in transition (making a big problem worse) — he's not much better against the PnR (0.86 PPP). And switching Kyrie on the PnR? That won't do much for the Cavs either — Kyrie has a turnover percentage of zero when he switches to the pick setter. 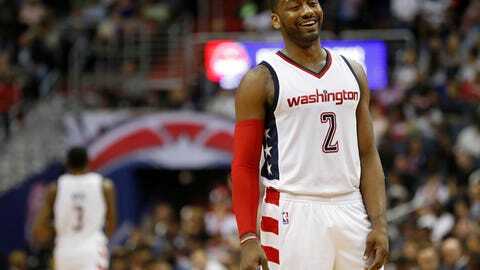 Wall is going to be able to operate in the half court as he sees fit, taking on two, and sometimes even three players as he drives to the basket. And surrounding him, more often than not, will be at least three players who can knock down an open 3-pointer. 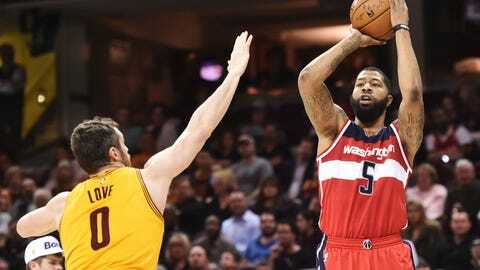 Again, the Wizards can't play a lick of defense either, but Washington is poised to score a ton of points against the Cavs should the two teams meet. And even for Cleveland and the greatest player on the planet, it's going to be tough to match.